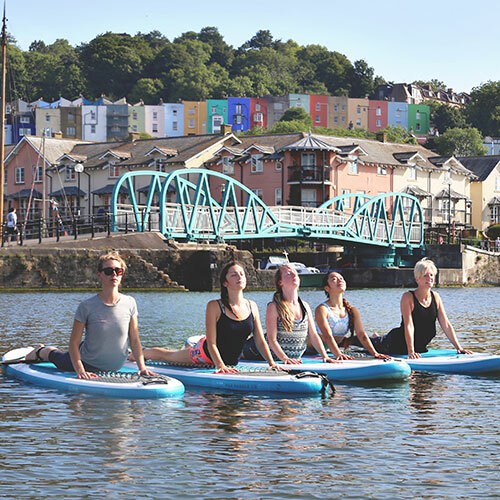 Take your yoga practice to the water with SUP Bristol this summer. SUP Yoga is great fun and a fantastic test for your balance. Either combine your introduction to paddling with an intro to SUP Yoga, or ask us about running a SUP yoga session for your group. Combine your introduction to stand up paddleboarding with an introduction to SUP yoga. Master standing on water and get ready for downward dog and sun salutations on your SUP. No experience necessary. Is your balance on your head as good as on your feet? Develop your SUP Yoga, building on your knowledge and confidence on a board. This session is for anyone who has had an intro to stand up paddleboarding with us already. Give us a call or email. We’re looking forward to arranging your session.